So this month was my first time participating in the Foodie Pen Pals program created by Lindsey at the Lean Green Bean blog! I have to say it was a lot of fun. When I received my package I felt like a little kid on Christmas! “What, oh what, could it be? !” I love being surprised. I like the feeling of anticipation and then being pleasantly surprised. Especially when the object of focus is food! Mmm. Deanna from Teaspoon of Spice did the job perfectly well! She left me super happy after getting this package. I was going to try so many different things! 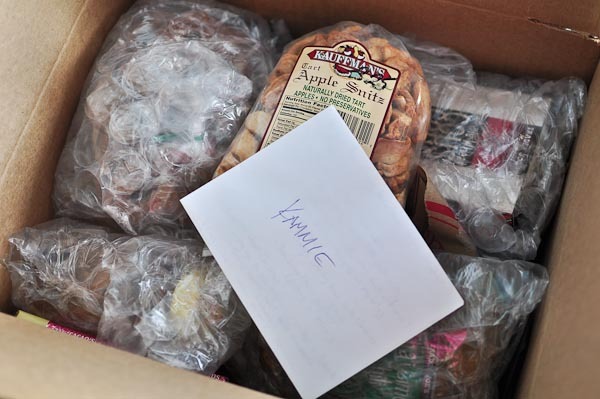 She also included a nice note inside with a breakdown of what was to be found in the package. First, I was happy that she included some local stuff. She visited Lancaster County in Pennsylvania and got me some goodies from the local Dutch farms. Those items included deliciously tart dried apples (surprisingly I have never had dried apples before – they were so good! 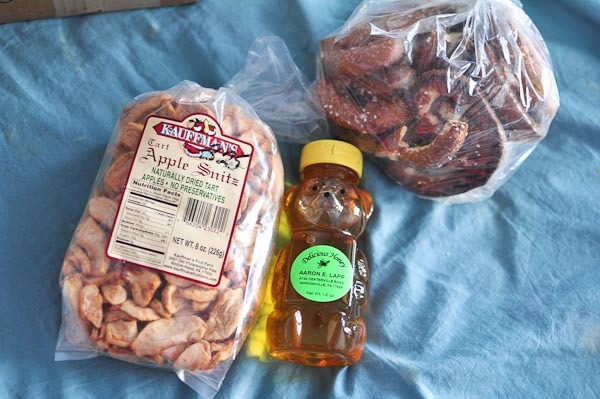 ), local honey (we all know I am obsessed with honey), and large hard pretzels. 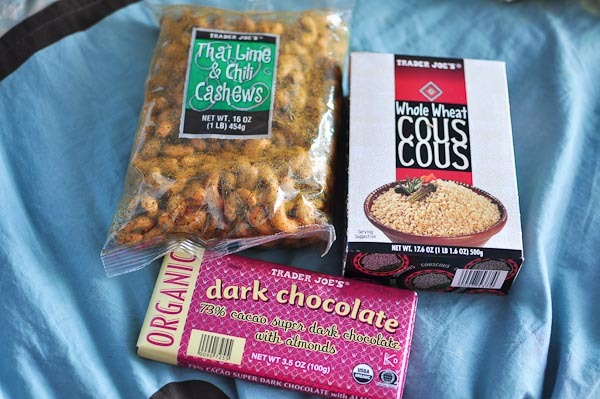 Then, she included some things from Trader Joe’s that she really likes. Trader Joe’s is my favorite grocery store so I was totally into it. She also managed to include all of the stuff I have NOT tried yet: organic dark chocolate with almonds (SO DELICIOUS! ), thai lime & chili cashews (nice and spicy), and whole wheat cous cous. Deanna did a great job and I definitely had a great time noshing on these delicious snacks. As you might have noticed I even used the apples in my vegan Bran Apple Muffins recipe. Thanks again to Deanna from Teaspoon of Spice. Foodie Pen Pals is a lot of fun. Since I am moving in the beginning of May, I will not be participating in May’s program, but keep posted for June! I most definitely will be participating again come June. 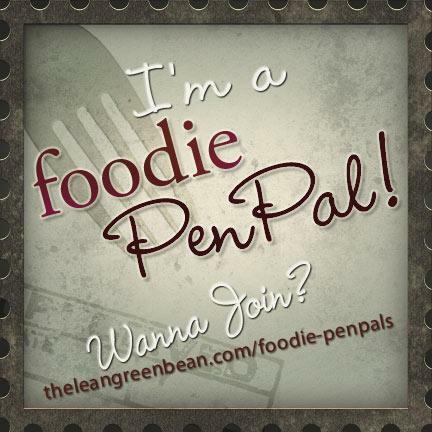 Want to participate in Foodie Pen Pals for May? If so, click here to find out more info and sign up! Looks fun! And like you got some tasty goodies! omg want one of those muffins for breakfast!!! sounds delicious! 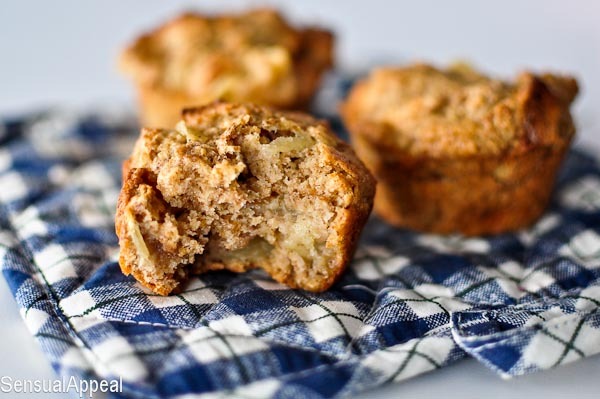 So glad you liked the package and love that you used the dried apples in a muffin recipe – yum! I want those cashews! Awesome goodies! I want to go to an Amish market SO BAD! I bet they have the best, coolest things ever!